Here we answer the questions we get asked most frequently about the oven cleaning service. For a peek at one of our cleaners in action – check out our TV ad! Ovenclean is the originator of professional oven cleaning services in the UK. With an established network of oven cleaning specialists throughout the UK, Ovenclean caters to thousands of satisfied customers nationwide. 2. How long has Ovenclean been established? Launched in 1994, Ovenclean is the UK’s first and most successful oven cleaning specialist, currently providing services to thousands of satisfied households across the UK! 3. Where do Ovenclean operate? Ovenclean specialists operate throughout the UK. For details of your local specialist, and for a free no obligation quote, please call 0800 840 7127 or alternatively, complete our online form! 4. Why should I use Ovenclean for my oven cleaning? Our unique cleaning system is completely exclusive to Ovenclean’s network of local specialists. The cleaning system and range of products ensure that our customers benefit from a safe working environment and a fume-free home. Furthermore, all cleaned ovens and appliances are completely safe to use just as soon as we’ve finished – no mess, no fuss, no bother! We aim to complete work with minimal disturbance to family and home. The professionalism and quality of our service, coupled with our innovative cleaning system all contribute to the convenience offered to our customers. We can provide an Ovenclean service that is completed to the highest standards by a skilled specialist in just a couple of hours, whilst maintaining a completely fume-free environment that facilitates completely safe use of all cleaned appliances once finished! Ovenclean customers are often overwhelmed by the quality of the service that they are provided by Ovenclean. Our goal is to complete every job to the very highest standard. 5. What Products do Ovenclean use? Ovenclean specialists clean ovens to near showroom condition within a matter of hours using a unique cleaning system and product range developed and perfected over 20 years of oven cleaning experience. These products together with the exclusive cleaning system, provides our customers with the highest quality cleans whilst also having no added caustic, being biodegradable and not tested on animals. These solutions comply with CHIP, ADR, IMDG and IATA legislation, EU regulations 1907/2006/EC Article 31 and biodegradability criteria as laid down in Regulation (EC) No 648/2004. Which is a long-winded way of saying we care. Our experience and continuous research and development makes Ovenclean’s product range, cleaning system and service is second to none, leaving pristine appliances with no mess, no fuss and no bother! 6. What do Ovenclean specialists do that I can't do myself? Our expertise stretches far beyond just cleaning ovens. We also clean: gas hobs, electric hobs and ceramic hobs, extractor fans, filters and hoods, microwave and combi-microwave ovens, barbeques and grills. We provide a vast selection of traditional stove cleaning services, including the cleaning of AGA’s, Rayburn’s and ‘Range style’ ovens, cookers and stoves. 7. Can Ovenclean clean 'self-cleaning' ovens? Yes, Ovenclean specialists are fully trained to clean self-cleaning ovens, and the range of Ovenclean products are specifically designed to cope with all oven types. Self-cleaning ovens comprise of self-clean interiors and/or liners, designed to burn off debris left behind from cooking. However, many do not reach the high temperature needed to produce the required result. Many Ovenclean customers express how difficult it can be to attempt cleaning such ovens themselves, as these liners ‘hide’ the majority of grease and fat build-up. 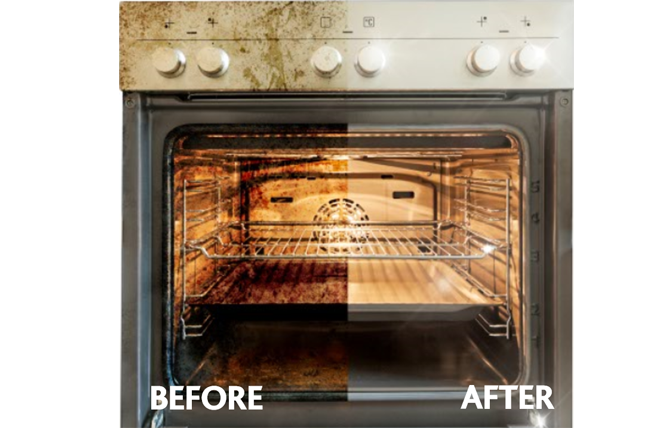 Your local Ovenclean specialist will be able to remove all fat, grease and carbon deposits that could otherwise have posed a fire risk; particularly around the main heating element. 8. What oven cleaning training do your specialists have? You can be assured that Ovenclean offer the highest standard in oven cleaning. Your appliances are in safe hands, as all Ovenclean specialists have been trained during a two-week intensive and practical course in-the-field with established Ovenclean specialists. 9. Do your operators carry spares? Yes. All Ovenclean specialists carry stock of replacement lamps, universal seals and a range of extraction filters. If you require additional or specialist spares, let your local specialist know in advance and Ovenclean can order the part for you, or recommend a reputable supplier. 10. How often will my oven need to be professionally cleaned? How often our customers need their appliances cleaned depends on what you cook and how often you use them. Regular use of the oven for traditionally prepared meals can require a quarterly or bi-annual deep clean, to avoid the build up of fat, grease and carbon deposits that could pose a potential fire hazard. For customers who rarely use their oven, or use it primarily for ready meals, we would recommend an annual ‘spring clean’ to revive the working components of your oven. 11. Are all Ovenclean specialists fully insured? All Ovenclean specialists are fully insured with a comprehensive £5,000,000 Public Liability Insurance. 12. How do I book an appointment? Either call us on 0800 840 7127, or complete our online form, for a free no obligation quote. We will pass your enquiry onto your local specialist who will be able to arrange an appointment with you at your convenience.